"We are here today – together – because we share a growing sense of alarm – but also to learn from each other, particularly from those countries who’ve already been responding to their own infestations, said Kundhavi Kadiresan, Assistant Director-General and FAO Regional Representative for Asia and the Pacific. 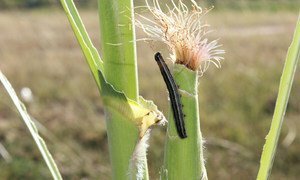 Fall armyworm (FAW for short) have been moving steadily east since 2016 and caused up to $3 billion-worth of damage to crops across Africa, according to reports. They lay eggs which develop fast into grubs, which can devastate crops such as maize, rice and sugarcane, overnight. Once an infestation is confirmed, governments are initiating efforts to continue to raise awareness and monitor the presence and spread of FAW on maize, their favourite food type, and other crops. FAO has been working with the relevant authorities to initiate awareness programmes that inform and train farmers on integrated pest management techniques. These include identifying the grub's natural enemies, enhancing natural biological controls and mechanical controls, such as crushing egg masses and using biopesticides. The use of chemical pesticides needs to be very carefully considered, FAO stresses, given that FAW larvae hide largely in the ring of leaves (whorl), and that chemical pesticides can have negative effects on environment and public health. This is taken into consideration at policy and field level. With these measures put in place, the negative effects of infestations can be sustainably managed and can help to maintain populations low enough to limit economic and livelihood damage. An “invasive pest” that devours more than 80 different plant species, including many staple crops, could threaten the food security and livelihoods of millions of small-scale farmers in Asia, the Food and Agriculture Organization (FAO) warned on Tuesday. 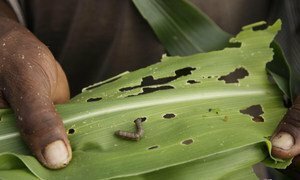 Farmers in sub-Saharan Africa have a new digital weapon in their agricultural armoury to take on the Fall Armyworm – a crop pest that’s threatening the food security of 300 million people – the United Nations said on Monday.